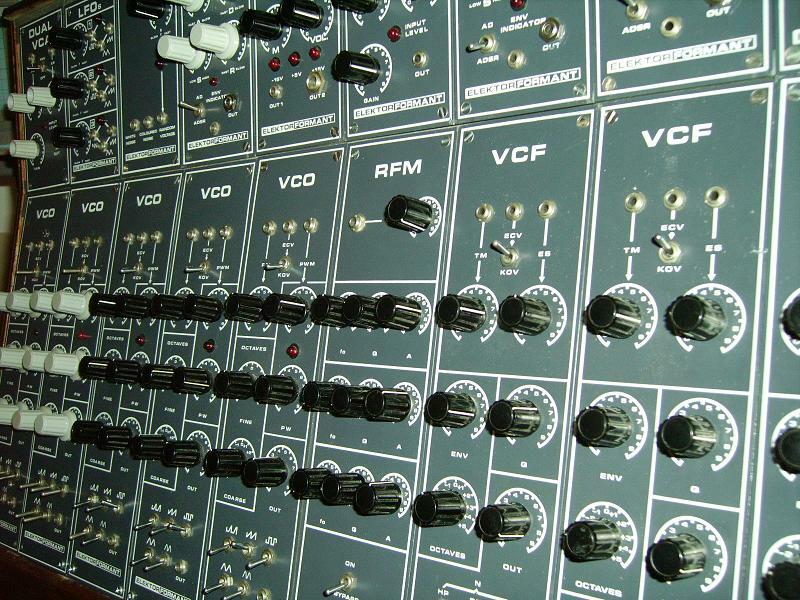 The schematics and description for the Elector Formant modular synthesizer was published in a series of Elektor magazine articles in 1977 and 1978. They were all hand-built by people with varied levels of skill. 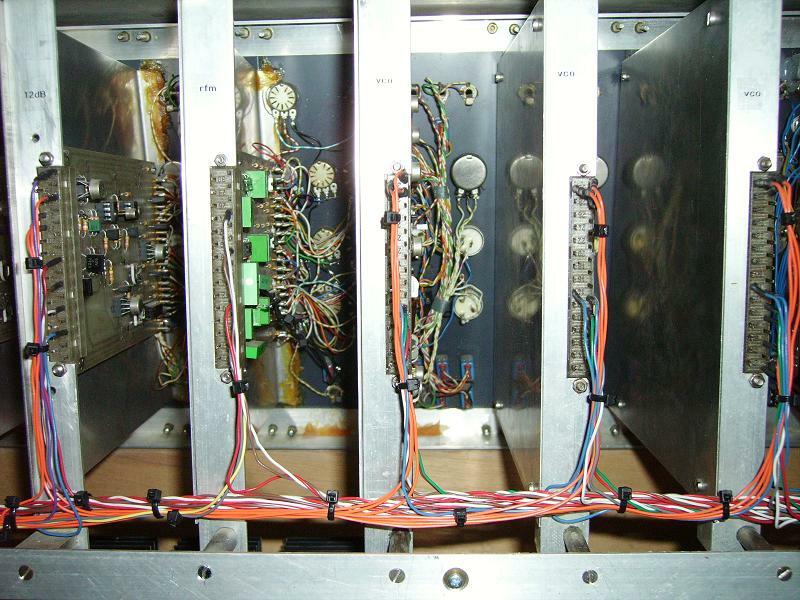 The circuit boards and Front Panels were made available making it appealing for DIYers of even modest skills. 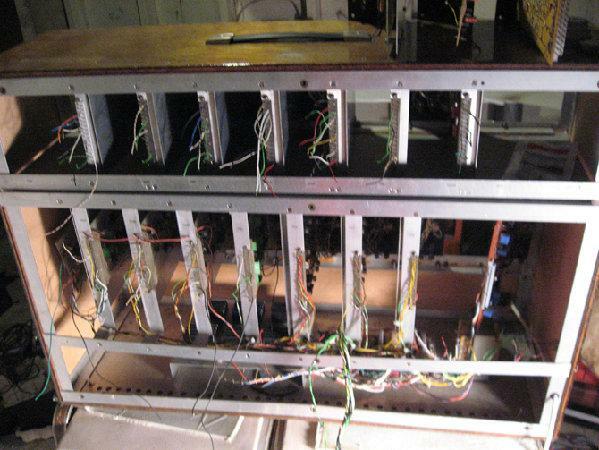 It's a modular design, but with a number of hardwired or 'normalled' connections so it can be played without doing any patching at all. 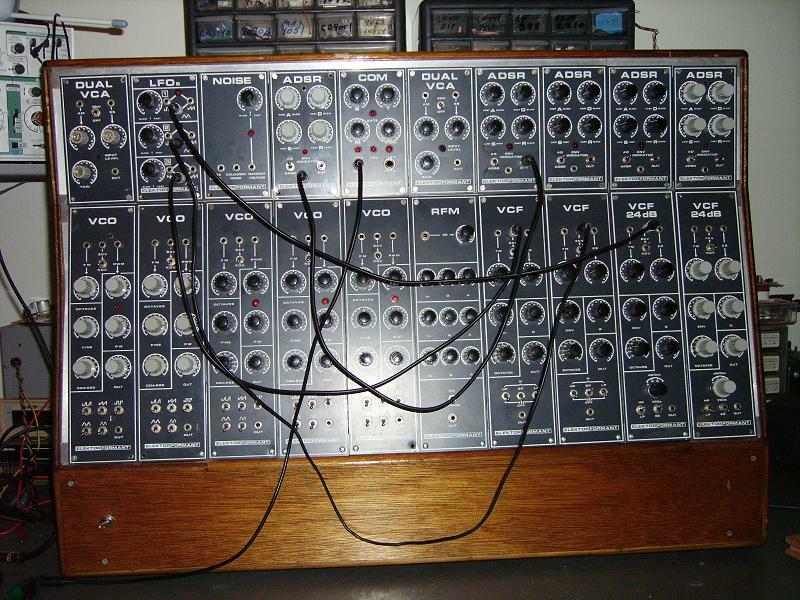 The Formant is voltage-controlled to the Moog standard of 1V/octave. In December of 2008 I was e-mailed by a friend from Electro-Music.com. 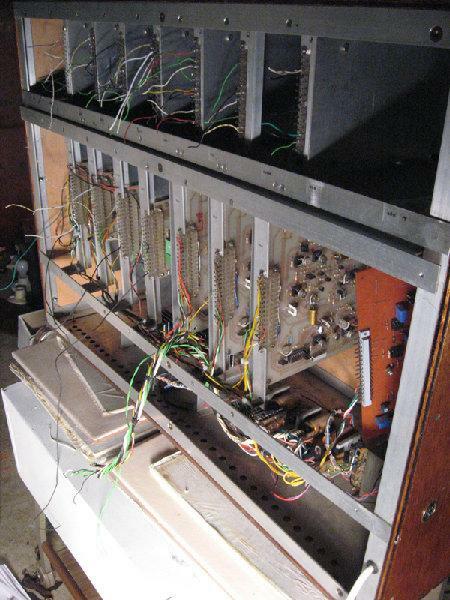 He had recently obtained an old Elektor Formant Synthesizer that needed a bit more work than he expected. We exchanged a number of messages and pictures over the next month or so and came to agreement on a trade of some of my DIY work for the Formant. ...The modules were already built be previous owners,not by me. I got this system from Germany,but it was not complete. Several blank spaces have been filled in with others,from a smaller second system i bought in Germany,along with a keyboard i found on eBay. I put the 2 systems together in the case you have now. As far as I can tell it went from Germany to Belgium to California to Indiana. And now it's in the Northwoods of Minnesota. In January 2008 the Formant arrived - and the repairs began. Here's what the wiring harness looked like. There were also a few issues like this circuit board, and module wiring that had come loose or broken. None of this was un-expected. 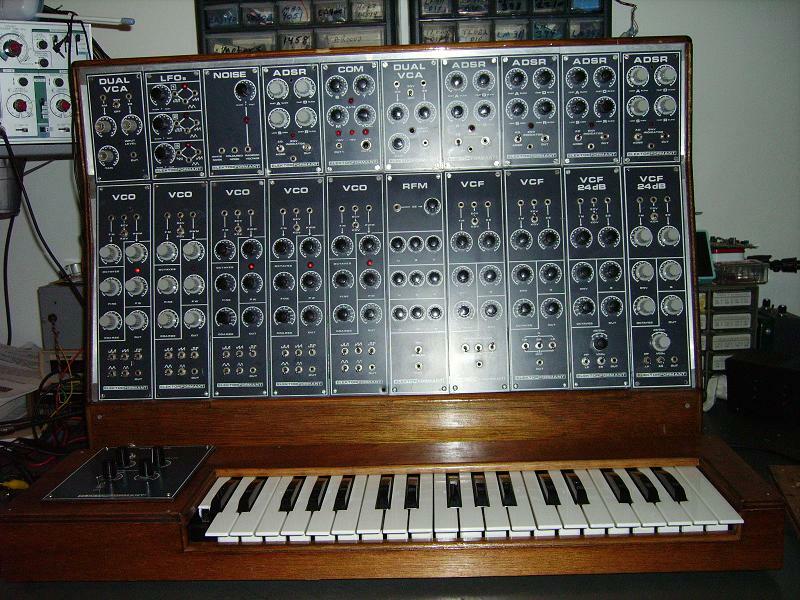 The person I got it from was very clear about the condition of the synth. I began with work on the modules - and discovered that most of them were in fairly good shape outside of a few broken wires or bad solder joints. I replaced a few capacitors, cleaned some connections and rewired a few LED's, Pots and Jacks. 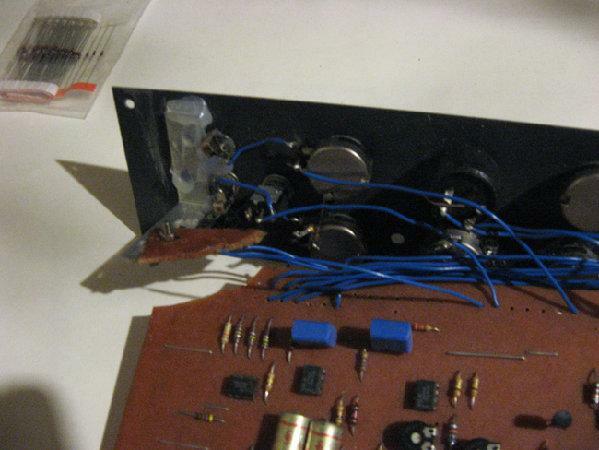 I made a modification to each of the Envelope Generators. They are normally hardwired to the keyboard interface, but I added a jack to the front panel to allow external triggering of the ADSR. When you patch into the external trigger jack it bypasses the internal signal. That really seemed like an oversite on the design of this ADSR. 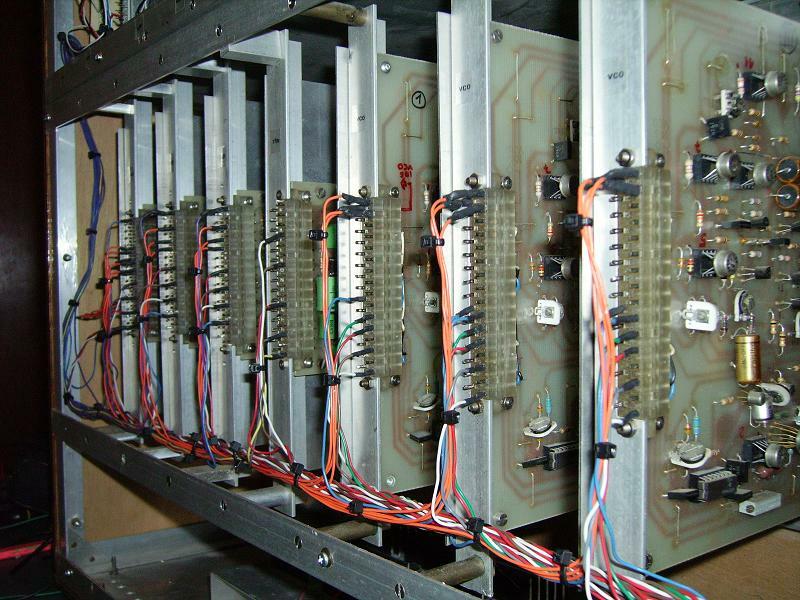 As the module repairs were finished I began on the wiring harness. After looking at the existing harness I decided to just remove all of the previous wiring and start from scratch. I ended up using cable ties, but have been thinking I may want to lace the harness. That's something for the future. I was able to obtain the book (published sometime after the original articles appeared) from a friend on Electro-Music.com for payment of the shipping charges. 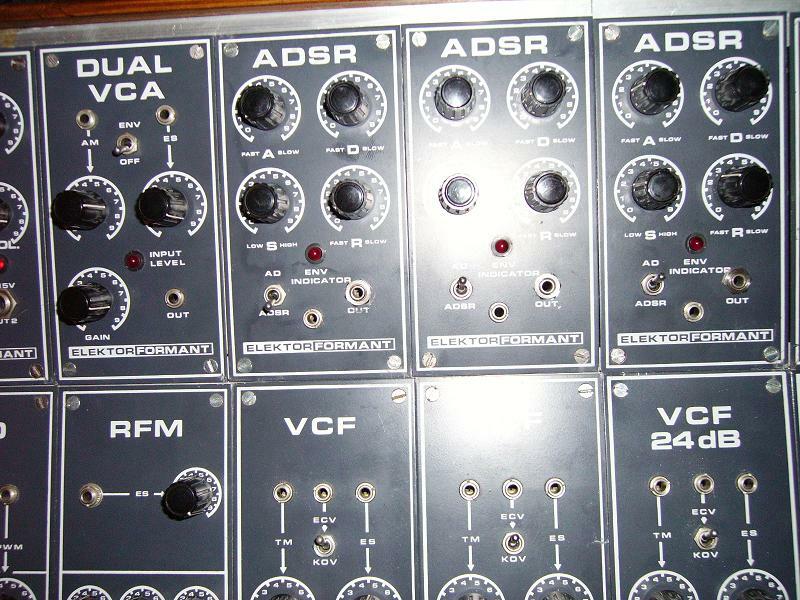 The book describes the keyboard, power supply, VCO, VCF, LFO, Noise, ADSR, VCA, COM (output module), RFM (Resonance Filter Module) and the 12 and 24dB VCF. It also has a section on playing the Formant, using the modules for specific sound creation and some theory of synthesis. There is a second book thst contains things like Ring Modulator, Envelope Follower, Mixer, Phase Shifter, ADSR Controller, VC-LFO's, Sample and Hold, but I've only been able to find a few PDF scans of it in German.